Not from the evidence, I've seen! Consider your bench design and method duly nicked. I showed your pics to The Management who said words to the effect of "Get on with it, then. 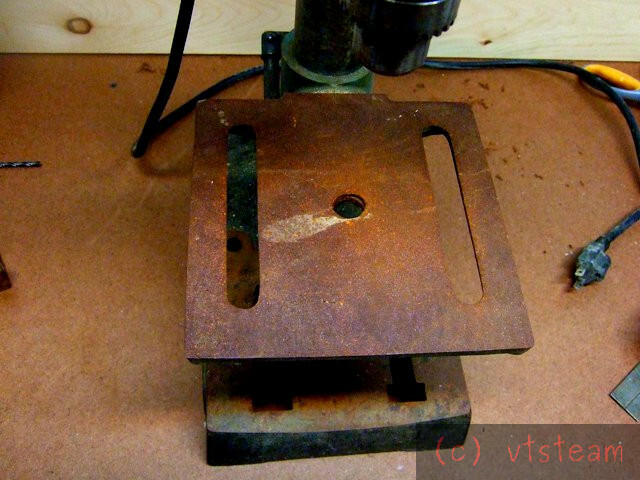 That old desk in the workshop is falling apart and I'm fed up of looking at it!" Eugene, that's great! Of course I nicked it from Dave Gingery, with some small changes to fit the dimensions of my tiny shop. And if you want to get it right from the horse's mouth, the design and full description is in "Uncle Dave Gingery's Shop Notebook" by Vincent Gingery. I think it costs about $7, and though not a big book, is definitely worth the price for the bench construction details alone. I was a DT teacher, before I retired three years ago, but not in UK so I didn't have to follow the British National Curriculum. I had the kids doing wood turning and making proper stuff. I think that they mostly enjoyed it and learned something. I have heard that my successor has them doing written work most of the time. Drives me nuts, Norman. I'm on the district school board and it's useless fighting the changes. People who don't know how to use their hands other than to drive to a store or hold a cell phone are directing kids into total incapability. They fear manual work, and hope children will never have to sink to that level. I used to be angry, now I'm just sad. I see it's hopeless to change it at the school administration level. To me a forum like this one preserves our skills, and our fascination and enjoyment in something well made. Problems overcome, design and execution, knowing how things work, what they are made of, and how they were made. People need that, and in fact want that. So here it is, a record of who we were, in this time, and what we made. In 20 years, most of us here will be gone. Remember what we did, if you're reading this then. And carry it on. You are as capable as you want to be. I finished making the drawers this afternoon. Still more to do, but I already put a few things that were lying around into them! It's a good looking bench I hope when I make mine it will look half as good! Finally today I cut up most of the scrap from the drawer wood into strips and added those as trim to the sides and between the drawers. Now they are flush and the plywood edges are covered. 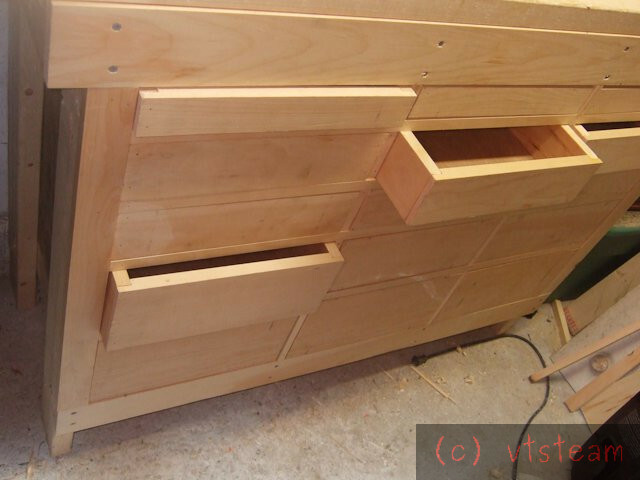 Only problem is........I should have made drawer handles first -- it's rough on the fingernails getting those drawers out! Why not bore finger holes - maybe a bit over an inch. Handles are going to snag you as you work in there. I just don't like 'em, Andrew. OK a 'hand rebate' in the top edge of each drawer? They're a bad enough problem without encouraging them.....OZ. maybe pre-cut kits of the non-ply parts.......? I have the standing timber and the sawmill......white pine, hemlock, hard birch, cherry, ash, basswood, maple, and oak. Couldn't do the plywood, though. People would have to supply their own. Could be custom sized benches, too, pretty easily, I think. It's something for me to think about. the local field mice would be putting up signs for the new condo development! you will have permanent bruises from the knobs. For bruise-free low-profile handles, how about popping a couple of very small holes 6" apart in each drawer front and then a length of cordage with a figure-of-8 knot on the inside of each end? Inset brass loop handles would be my choice. What about a knotted rope pull? Well, I'll probably spoil the suspense by saying it, but I just planned on making them out of wood! Lots of idea creativity here, though. Today I went to the lumberyard again and picked up a sheet of 1/4" tempered hardboard (we used to call it Masonite) to surface the bench with. After I got back home, I replaced the benchtop timber I had sawn off a few days ago to gain access to the back of the bench. It was just a matter of screwing the 2 by 4s to the rear legs and to a cleat under the joint between the two sections. Then I took an 8 foot 2 by 4 and ripped it into a 1-1/2" square section, and rabbeted it 1/4" deep and 3/4" across on the table saw to serve as a cap. The rabbet is there to accept the hardboard. 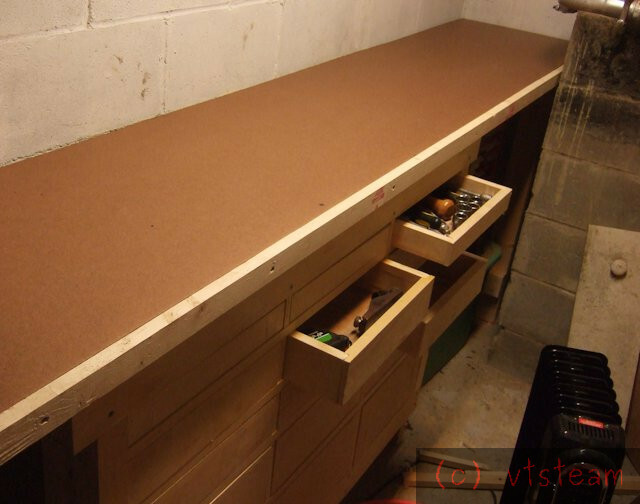 I attached the cap to the benchtop all the way to the back wall, further stiffening the joint between the two halves of the top. Then I ripped a full length strip of hardboard (without a helper or a big bench it was like like trying to saw a wet noodle!) and screwed it down, countersinking the screws. Here it is when I was done. The bench is back to the full 8' long, and the cap padded it out to just short of 20" in width. I don't think i've ever fully finished a project. I'm one of those guys that gets a thing to the point that it's working, if just barely, and that's good enough. I visited a DT teacher at the school my mom works at. Canny guy, gave me a bunch of wood and metal that they'd probably end up just throwing out some day. Had some big disks of mahogany that they'd gotten from an old fire station where used them to hang the helmets, and they came in handy almost immediately for extending the legs on my grandma's chair. They were the right colour and shape too. It sounds corny, but i've learned more from the internet than I ever did in school. I think given the width of the space that making the handles as flat as possible would be a good plan - sonner or later you will be cursing sticky out ones. I like the brass ones but I think they would cost more than the rest of the project put together so I wouldn't go for those. I approve of the sentiment with the rope ideas but I think they would spoil the look of the drawers. I have some other ideas You could use lie flat leather strap handles as used on trunks and briefcases. I'm sure you could make something from an old belt. I think that would look better than rope or string. You could use webbing instead of any of the leather or string suggestions. You could make wooden flush handles as used on boats and set them into the drawer fronts or use a router to make a knob directly in the drawer front (beyond me - but I suspect not beyond you). 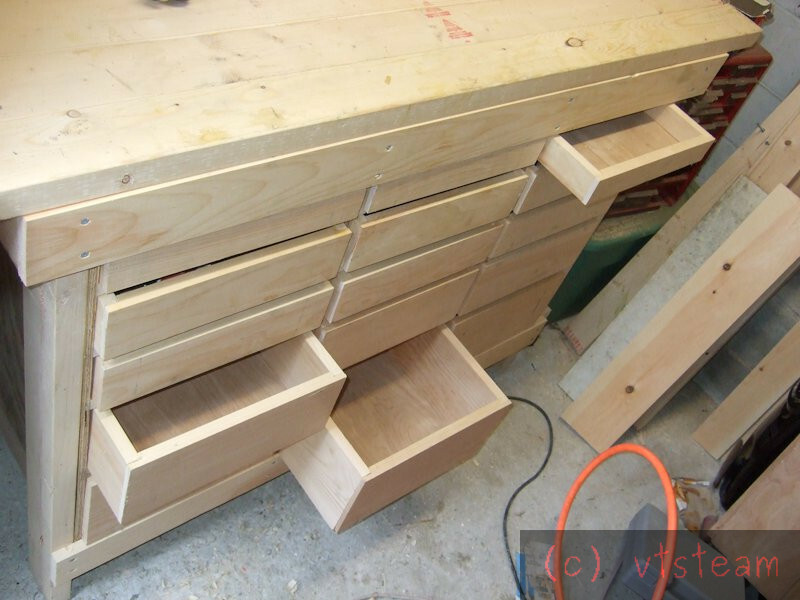 I think the drawers look great - far too good for a workbench. The drawers on my workbench don't even match - they have been reclaimed from old furniture and rails bodged to fit. 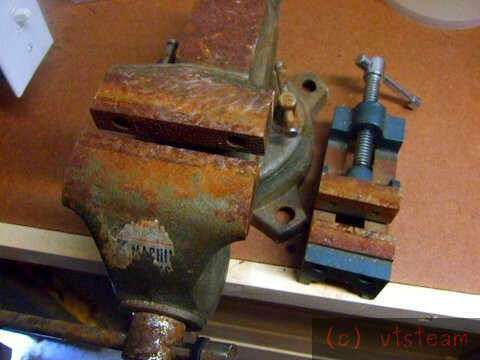 After pulling out the vise and drill press to see how they fit on the bench top, I decided to spend the afternoon cleaning off the storage rust. Since it's too cold to keep a tub of water and soda electrolyte, or connect a hose to rinse them off, as in summer, I decided to try to use a damp cloth to carry electrolyte, and clean some pieces, in situ.